This year, approximately 1 in 10 children born in Pennsylvania is at risk of being born with a Fetal Alcohol Spectrum Disorder (FASD). With almost 11 percent of pregnant women reporting that they are still consuming alcohol, it’s more important than ever to protect the next generation from FASD. Compass Mark is working to raise awareness and prevent unsafe alcohol consumption, which can lead to tragic consequences. 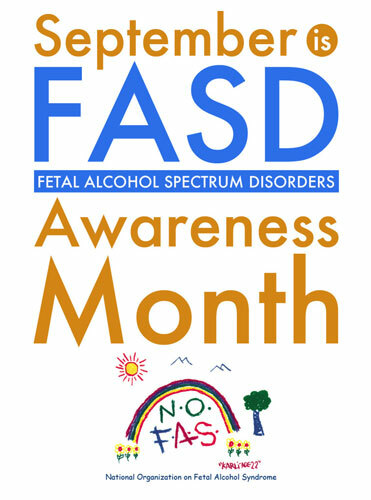 FASD refers to a range of effects—including physical, mental, behavioral and learning disabilities—that can impact children who are exposed to alcohol before birth. Any woman who consumes alcohol while pregnant is at risk of having a child with a FASD. In fact, alcohol use during pregnancy is the leading known cause of developmental disabilities and birth defects in the United States. A 2009 study even found that as many as 2-5 percent of school age children have a FASD. Sadly, many women do not know they are pregnant for weeks or even months, during which time they may drink alcohol and unknowingly cause damage to their baby, ranging from mild to significant effects. Alcohol is most dangerous to the fetus during the first trimester. These facts are particularly problematic considering that the CDC has found that nearly 1 in 8 women in the US report binge drinking three times a month. When a pregnant woman binge drinks, her baby does, too. The developing baby’s organs are not fully formed, so the baby can’t process the alcohol normally. Alcohol stops the baby from getting the oxygen and nutrients it needs for its brain to develop and causes developmental issues with other organs as well. Fetal Alcohol Spectrum Disorders Awareness Month is coming up in September, and Compass Mark is working to raise awareness of FASD, encouraging women to make healthy and safe life choices. Sechrist notes, “In the prevention field, rather than shaming, we want to offer information about the effects of alcohol during pregnancy and empower women.” Compass Mark is partnering with the Lancaster County Drug & Alcohol Commission to offer the event FASD & NAS: Helping Children and Their Families in Lancaster County; free to those who live or work in Lancaster County. Compass Mark’s information & referral team offers confidential assistance for individuals who are struggling with alcohol. Call today or visit our website to learn more about FASD and local treatment and recovery support services.